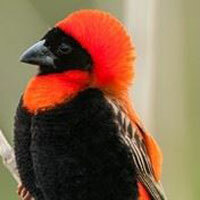 A good tour for a morning includes Talana or Mpati Hill, the Oaks Dam and possibly Cotswold. 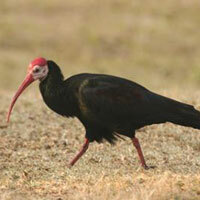 The area boasts many bird species and awesome scenery. Remember to wear suitable clothes and shoes for the terrain, a hat and sun protection. There are no toilets in the areas, so one must be prepared to use the bush. 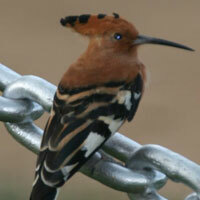 Don’t forget your binoculars and birding books to tick the box. Depart Dundee at 8:15 via Nquthu. 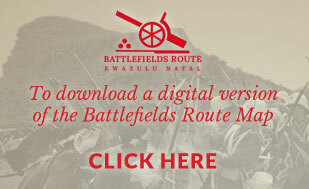 Visit the site where the young Prince Impérial, Louis Napoléon of France met his untimely fate on I June 1879, in the closing stages of the Anglo-Zulu War of 1879. His poignant monument in the picturesque countryside is also the place where his mother (the Empress Eugénie) spent a solitary night on the anniversary of his death a year later. Dundee and the surrounding area is rich in history and numerous historical buildings and sites are a testament to our past heritage. If only these buildings could talk – but your guide can and will keep you enthralled with the stories and the people associated with the buildings. 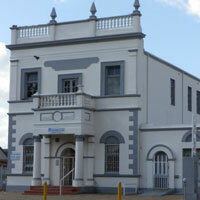 There are a number of other heritage trails in and around the town. These need vehicle access and the heritage trail brochure is available from the Tourism Office, Talana Museum. Talana Museum is situated on the outskirts of the town of Dundee, on the Talana Battlefield, site of the original farmstead of Peter Smith. The town of Dundee was named by Peter Smith one of the founders who came from a small village near Dundee, Scotland. 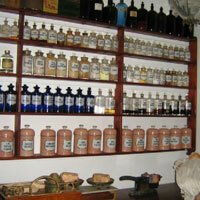 The Smith Cottage has been restored and furnished with period accuracy. 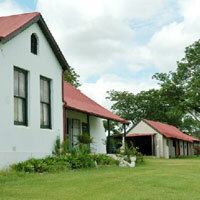 Talana House, built in 1894, exhibits artefacts from the earliest inhabitants of the area, as well as the military history of the Voortrekkers in the Endumeni valley and the Anglo-Zulu and Anglo-Boer Wars, with emphasis on the battle of Talana. The combined Museum complex which also incorporates within its precincts the Kwakunje Cultural Village is a living vibrant place that gives a whole new meaning to the commonly held view and concept of ‘Museum’! The red brick Henderson Hall contains a magnificent glass and bead collection, the Chamber of Mines Coal Museum and the Iscor Hall of Mining. A typical coalminer’s home of the 1920’s was relocated to the museum from the Ballengeich Colliery, and now houses the Miner’s Rest Restaurant. Exhibits on the “Great War” and the 1913 Passive Resistance Movement put the people and role of Dundee in the context of major world events. The Museum Shop sells many items produced by local crafters as well as a comprehensive stock of books on the history of the area. Open weekdays 8:00-16:30. 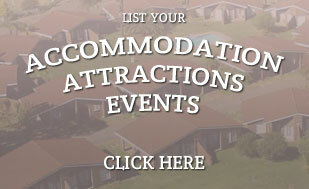 Weekends and public holidays 9:00-16:30. 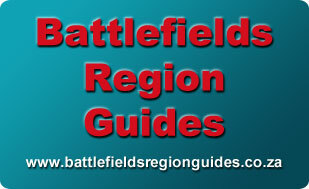 You may hire a guide for your visit, which will enhance the exhibits and battlefield experience or you may do the museum as a self guided visit. Allow at least 3-4 hours. 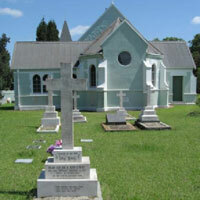 By 1836 relations between the British rulers in the Cape and the Dutch settlers had reached an all- time low. 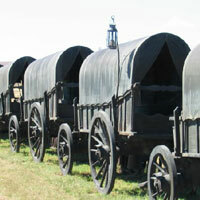 They decided to pack-up their worldly goods load them onto covered wagons and head into the largely unknown interior of South Africa. 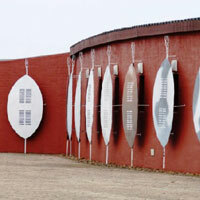 Thus began in 1836 the exodus that would be recorded by history as ‘The Great Trek’! The north, west and eastward movement of this exodus of Trekkers, who became known as Voortrekkers inevitably led to conflict with the indigenous peoples who inhabited the hinterland. 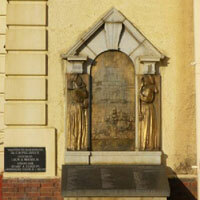 Trek leader Piet Retief and his party were killed at King Dingane’s capital of Mgungundlovu in February 1838. In December of that year Andries Pretorius led a commando consisting of 464 men to a strategic site on the banks of the Ncome (‘Praiseworthy’) river. The commando formed a defensive position with their 64 wagons (known as a laager) and awaited the Zulu onslaught. The Zulu army attacked across the Ncome River their strength estimated to be between 12,000 and 15,000. This battle took place on Sunday 16th December 1838. In the ensuing struggle approximately 3000 brave Zulu warriors perished. So many died it is said that the river ran red with blood, hence the modern day name – Blood River! 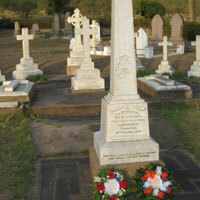 The Boer commando suffered no dead, only a small number of wounded. 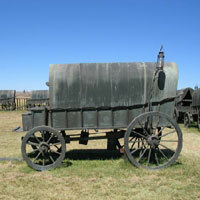 Today visitors can view a replica laager, with 64 life-size ox-wagons cast in bronze at the site of the Blood River/Ncome Battlefield. Across the river is the Ncome memorial to the Zulu warriors who died in the battle. 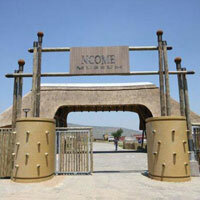 The Ncome Museum is a unique building, taking its shape from the Zulu battle formation, known as the ‘Horns of the Beast’, initiated by King Shaka kaSenzangakhona. 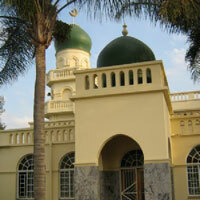 Drive through the Wasbank valley to the magnificent site of Maria Ratschitz mission at the base of Hlatikulu mountain. 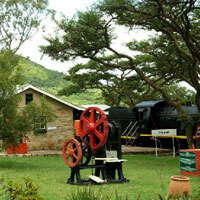 Established in 1882 this out station of Marianhill, has a wonderful history. 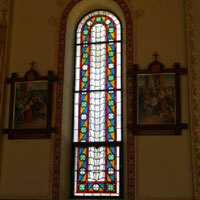 The cathedral-like church has decorated interior walls, which have been restored to their original magnificence. This peaceful place nestled in the foothills of the Biggarsberg Mountains was founded and built by the Trappists under the leadership of Abbot Francis Pfanner, in 1890. The community around the mission flourished and many skills were imparted – farming, carpentry, metal work and general building. 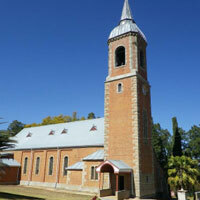 In 1892 a primary, senior and boarding school were established. The children received an excellent education. As a consequence of forced removals in 1968 the entire complex ceased to function and went into decline. The uninhabited buildings turned slowly into ruins. The majestic church also deteriorated. 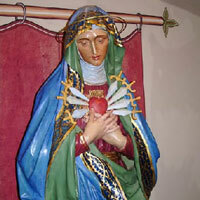 In 1996 after receiving a large anonymous donation from Germany for the specific purpose of restoring the church and mission, the Diocese of Dundee embarked on the restoration of Maria Ratschitz. In the year 2000 the work was completed and today the visitor can truly enjoy the peace and solitude of this special place. 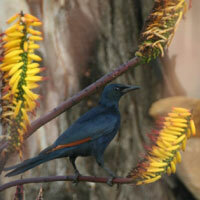 The gardens are lovingly cared for and many have described this oasis in the wilderness as a little piece of paradise! 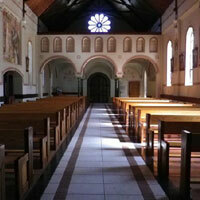 The restoration of the buildings and site have been remarkable over the past 20 years. Now an Aids hospice, a retirement home for nuns, a retreat and a remarkable site – peaceful, thought provoking and a visit that will remain in your minds and hearts for year’s to come.